Tall and narrow, this steamer is not only ideal for cooking asparagus, it's also great for other long vegetables like corn on the cob and carrots and for steaming clams and boiling eggs. 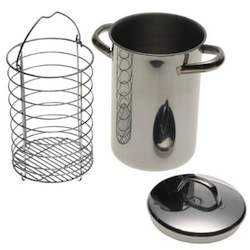 A sturdy, stainless-steel basket fits inside and has a handle to lift it from the pot and feet to keep it stable on a counter. With a 3-1/2-quart capacity, the steamer also can be used as a small stockpot. It measures 8-1/4 inches deep, ample for standing asparagus spears upright and boiling their tough bottom ends while steaming their tender tips for uniform cooking. The pot and lid are made of 18/10 stainless steel polished to a mirror-finish, and the pot's hollow handles stay cool on the stove top. The steamer is dishwasher-safe.